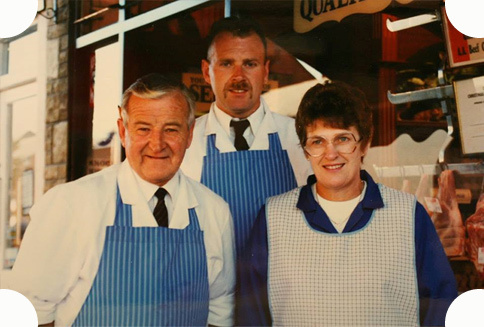 Founded in 1985, by professional butcher Keith Crump and wife Jean (pic. right), and continued today by their son Andy, we are a family butcher who know one thing above all else – our customers are number one! No other butcher strives harder to be the best traditional butcher in the Swindon area and the quality and excellence of our meats mean our customers keep coming back! Thirty years ago Keith and Jean Crump took a detour on their way home to Oxfordshire. The couple, who had spent months scouring Devon and Cornwall in vain for the perfect village shop to house their family butcher's, fancied a brief break from the road. Driving down Wootton Bassett High Street a 'for sale' sign caught their attention. The town centre has changed beyond recognition since that fateful day in 1985 but despite the crushing march of supermarket giants, K&EJ Crump & Son remains a welcome constant for legions of loyal customers. “Obviously it was fate” says Andy Crump, 49, who took over the family business when his late father Keith retired in 1999. 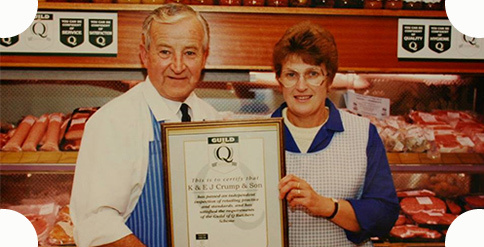 K&EJ Crump & Son counts six full-time staff including Andy and four part-time employees. Since its inception, the business has won 14 gold and eight silver medals. The Bassett Banger 'dreamt up' by Keith remains a firm favourite in the town. The store sells ten times as many as any other variety. Over the last 30 years, the going has been tough for independent shopkeepers on the nation's High Streets. Contending with large supermarkets has proven challenging at the best of times for the Crumps but the business continues to thrive.